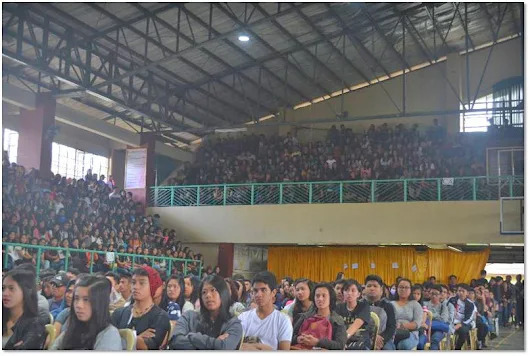 New students (freshmen and transferees) were welcomed to the university through the “Gabay sa Bagong Bahay 2018” program conducted on August 6, 2018 at the Benguet State University Gymnasium by the Office of Student Services-Guidance and Counseling Unit, in coordination with the Supreme Student Government. The activity aimed to assist the new students in adjusting to their new academic environment by familiarizing them with the different university services, procedures, officials, and facilities. The activity commenced with an Opening and Welcome Remarks from the Vice President for Academic Affairs, Dr. Kenneth A. Laruan. This was followed by a video presentation on the University History, Vision,Mission, Goals, Objectives, Core Values, Quality Objectives, and University Officials.This was followed by an inspirational message from the University President, Dr. Feliciano G. Calora, Jr. He encouraged the students to aim excellence in their studies. He added that if they finish their studies, they should not only consider the local employment opportunities but also the possibilities of being hired abroad. After the message, the SSG Officers and Peer Facilitators toured the new students around the different colleges, institutes, and facilities (i.e. Library) of BSU. The University/Campus Tour aimed to familiarize the students with the different university buildings and facilities. In the afternoon session, the students were oriented on the different student services of the university. Hence, Dr. Marlene B. Atinyao, the Director of the Office of the University Registrar, oriented the participants on the different requirements, policies and other services implemented by the OUR. Dr. Florence V. Poltic, the University Physician, followed to orient the students in the different medical and dental services they can avail while enrolled in BSU. The participants were also welcomed to the University Library through a message by the University Chief Librarian, Mr. Lauren P. Kipaan. His message was followed by a video presentation of the Library Services and Policies. The Head of the OSS-GCU, Ms. Maricris P. Lad-ey, on one hand, oriented the participants on the different student development and wellness services and programs of the OSS that the students can avail or participate in. Different private scholarships/grants, which are open for applications were also announced. 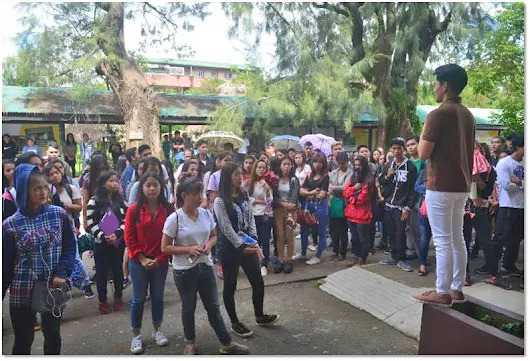 “#KilometrongLayobakamo?.”: To familiarize students with the different buildings and facilities of the university, the students had a Campus/University tour facilitated by the SSG officers and PFs.